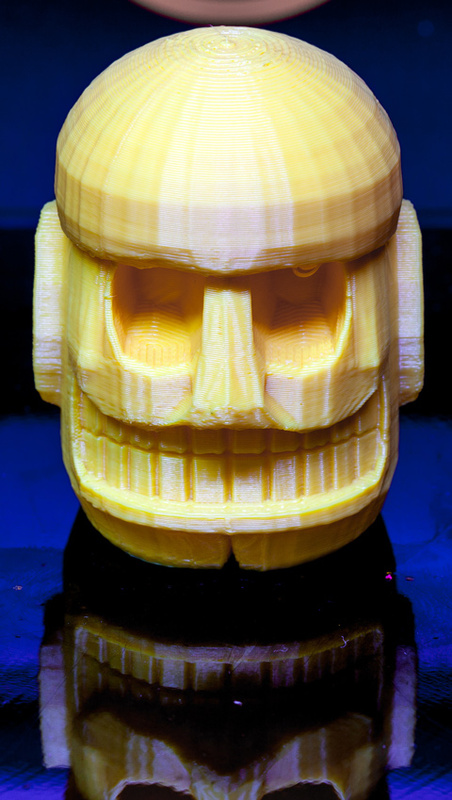 It's the Golden Idol from Spelunky, printed here at miniature size. While I'm gushing about software I like, Spelunky is so good. If you like hard platformers, you should play it. Even though it's a roguelike, the adage that "Spelunky has a robust leveling system -- it's just inside your heart" is really true, and I've been playing for months and still haven't beaten it the hardest way. Anyway, I can just make my own treasure so no big deal. Here's a timelapse video of it 3D-printing. Awesome. The "Thingiverse" site reminds me of the other site Shapeways, which will print models for you and ship them to you (of course it isn't free) or allow you to sell the object online so that other people can pay to get it 3D printed and then optionally give a small amount of profits to you. There appear to be some forward timejumps in that video. They're near 0:22, 0:29, 0:40, 0:43, 0:51, 0:57. Can you explain these? BTW I beat Spelunky the hard way now.